Nice video of John Cunningham soloing on the Ben in the mid 1970's. Thanks to Paul Cunningham for sharing that. I'd seen this before at the Ice Men gathering I hosted a few years ago at the Fort William Mountain festival with Yvon Chouinard (who shot the film), Jimmy Marshall and Hamish McInnes. It was nice to see it again and watching it made me think how little has changed today in highland climbing. Maybe not on the Ben which is a tad busier on weekends, but highland climbing is still a relaxed, exploratory, wild and sometimes lonely affair, 40 odd years later. Here's to that. I'm more likely to end the day with tea than a dram though, and then get training! Long day of writing and training today, feeling weak but enjoying Donald's excellent problem setting on the dry tooling board at Al's place, after bouldering on my own board. It's been a few years since I spent a decent amount of time climbing with tools in my hands and after the last session or two I'm really locked into the idea of turning some sustained tool training into a very hard route on Ben Nevis this season. Still probably too hard to succeed, but the last couple of days are certainly on the right path. I learned a completely new move from Kev for swinging feet across a roof without losing body tension. Fantastic, but after trying the problem about 20 times repeatedly flipping upside down gave me such a stomach ache I ended up having to stop three times on the way home to moan and groan to myself in pain. Sign of a good training session I suppose. Tool training on my board last night. Seconds later I wiped out flat on my back and spent the rest of the session rolling around trying to get some wind back in my lungs. Need more mattage! I’m gradually getting used to my home board with nightly sessions after work. It’s the best thing since sliced bread. 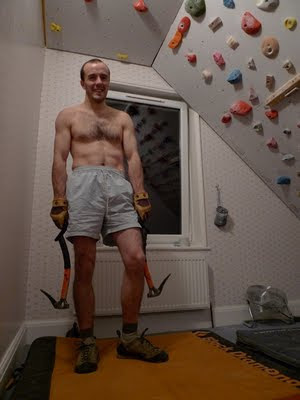 My cadre of project problems is getting big and vaired enough now to get the strength gains coming although I must admit I find endurance circuits harder than training on real routes (but still the way to go - just need decent music and a nice circuit). I’m trying to mix in my training for the winter season and making a little progress with fitness and technique with tools, although I feel that I’ve only just got started here. Doing both is feeling hard on the body, which is demanding an extra hour of sleep per night. So that’s one less hour working on my book, but such is life. The weather man is saying November is going to be warm so it looks like I’ve got time to generate some decent gains in time for the arrival of white frosty stuff plastering Scottish mountains. Brilliant to have my winter project as a clear focus for the season, and a good scene of Lochaber strong-men to share training with. Some are suffering for their art a little too much at times - check out big Al’s skull damage here. Wasted arms, big smile. Time for a cup of tea. I used up the last of my mini-peak on my Sky Pilot project and all the rest was making me lose fitness, with no sign of success imminent just yet. So it was a great relief to get back to training every day. When I say great relief, I just mean I hate hate hate losing fitness, and love gaining it, simple as that. I still haven't even scratched the surface of using my board to it’s full extent, and quite perversely looking forward to the dark winter months of full scale daily training on it. 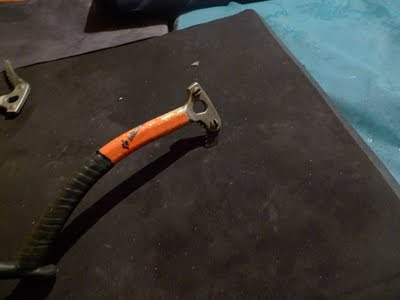 Starting to train with axes again for winter gave my elbow a bit of a fright, which was worrying. But this was followed by a bit of a kickstart and it seems stronger than ever. Tomorrow: 4 hours training, 12 hours book writing, many cups of tea, few meals, large bags under eyes. Thusrday: I’m speaking in Dundee, see you there. This year’s DVD release from Hot Aches is just out and available from my shop right here. The Singlehanded section just went down a storm at the Edinburgh Mountain Film Festival on Sunday, scooping a couple of prizes. ‘Singlehanded’ with Kev Shields soloing E6 and M10+ drytooling with the prosthetic ice axe that replaces his missing left hand. If you’ve ever done E6 or even worse M10+ you’ll be like me and watch with uncomfortable trepidation as Kev demonstrates it (just) with one hand less than most of us. There’s also welsh slate weirdness with master Johnny Dawes, Matt Segal and Hazel Findlay, Big Wall 8b+ in Madagascar with James McHaffie and E8 in Squamish (yes - Squamish!) with Sonnie Trotter. The full lowdown on the lineup is here. The Madagascar big walling looks quite sublime - would love to go there someday. Kev’s film is my favourite though I guess because it deals head on with the dangerous addiction of soloing harder and harder rock climbs - a life enriching, but potentially life destroying pastime. Always a great paradox for bold climbers to grapple with. I’m always interested to hear the thoughts of those who are prepared to share them on this subject. Other news from our shop is that we’ve put Cubby’s logbook (always a Christmas favourite) on sale from it’s RRP of £15 down to £5. I’ve had better weeks. Started off Sunday all set to go on a quick raid to Hoy only to come down with a miserable cold and have to cancel at the last moment. What a bummer. That kind of took the wind out of my sails I must admit. I spent the week working on my book and feeling sorry for myself. Today I felt good for climbing again and snatched a lovely afternoon at Sky Pilot. Still feeling reasonable on the project even after 4 fitness draining days off, but need to turn around a backward performance trajectory double quick. Good progress on the book though which has got me pretty keen to really get my sleeves up with this project. Maybe see you at the Edinburgh Mountain Film Festival on Sunday night at my lecture? 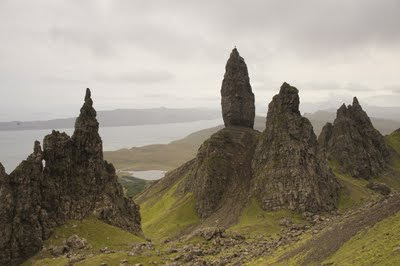 A few weeks ago myself and Blair climbed the Old Man of Storr on Skye. I was waiting to get a picture of it from Cubby who came along for some shots to post it up. I found not a single trustworthy runner on the entire thing and more or less every hold was quite freely detachable. So I wouldn't recommend it for the faint hearted. 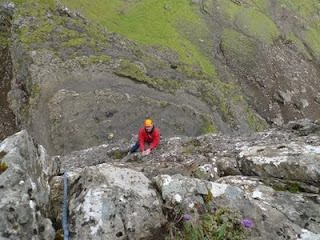 We climbed it by Mick Fowler’s route on the north side, which seems to be the easiest method. I stood on the top for about ten minutes so that Cubby could take a picture with each of his numerous cameras and lenses. It was pretty damn hard to stand up in a gusty gale and seriously added to the feeling of exposure perched on top of this Skye rocket. Blair enjoying the rotten, collapsing weetabix basalt. At least there were not many runners to take out. We’ve just changed our worldwide postage rates in the shop - Orders over £30 now have free shipping to anywhere in the world. Under £30 is £1.50. Payments are still via PayPal which accepts most major cards and payment methods. 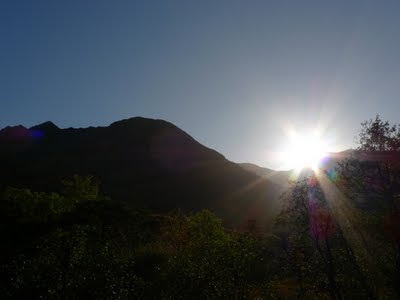 Ben Nevis - the new edition of it’s history, I’ve just reviewed it here. 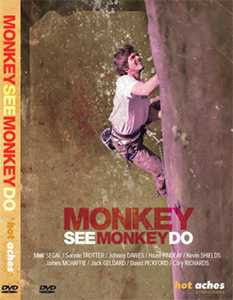 The Players DVD - Americas finest big name climbers of the moment in a host of different locations and beautifully filmed routes and problems. Espresso Lessons - The new book from Arno Ilgner (who wrote The Rock Warriors Way) with quick, accessible and practical tips for climbers to improve their mental skills and confidence in climbing. Coming shortly will be the new Hot Aches film Monkey See Monkey Do, the new Progression DVD from Big UP, and the Mountain Equipment hats that you’ve all been asking me to get hold of for the past year! About 14 years ago, I got a book out of the library that chronicled the history of climbing on Ben Nevis. It was an epic story of the challenges, hardships, adventures and joyous moments of seemingly every famous climber on the planet. I found it absolutely riveting. 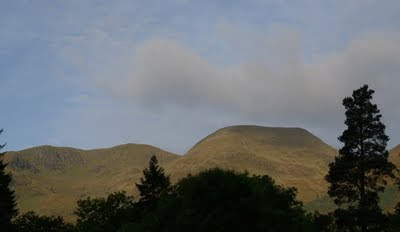 Never yet having been to Ben Nevis, it illuminated why this mountain was so important in world mountaineering, despite lacking the scale of the greater ranges. It was abundantly clear from Ken Crocket’s labour of love on the book that this was a special place. But that was just from reading it. I also pored over the photography. Fascinated by the old black and white stills of the earliest climbers, the great snows of pre-warming winters (and summers) and the countless facets, gullies and elegant buttresses of rock on the north face. The adventure for me had already begun. Just from those photos I began for the very first time to compare photos of the cliffs to the recorded routes and question why this line or that didn’t seem to have been climbed. The specific areas that caught my eye for this reason were the upper grooves and lower barrier of The Comb, and the great dark mass of Echo Wall. They simmered in my mind until I climbed them many years later. So sitting in my bedroom at home reading Ken’s original edition, did, in part, awake an interest in new routing and in Ben Nevis that shaped the next part of my life. And so yesterday, the new edition dropped through my letterbox. 23 years after the first edition, Ken, with Simon Richardson have laboured to update, expand and enrich the chronicle and bring it up to date, starting with the earliest map makers of highland Scotland in 1585 and ending with my ascent of Echo Wall last July. The new edition benefits hugely from the exponentially expanding archive of photography and colour printing with many more photographs both from the distant past from valuable Scottish archives like Am Baile. But also professional climbing photographers like Cubby and Ian Parnell and the many who’ve made their own high quality images findable through the connectedness of digital media. So there are photographs on nearly every page - the many parts of the mountain are brought to life. As are the climbers, with fascinating portrait shots of the many famous names I’d only read about and never been able to put a face to - Con Higgins, Murray Hamilton, Kenny Spence, Pete Whillance, Arthur Paul, Alan Rouse, Mick Geddes, Ian Fulton to name just a few. There are also many early colour photos I’d never come across of the likes of Robin Smith, Marshall and Haston that have been secured for the new edition. 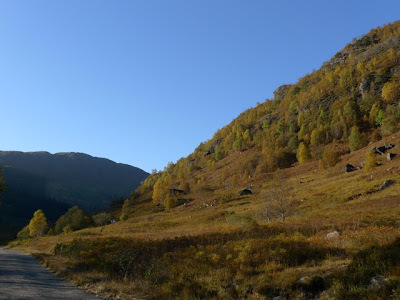 Other new additions were a series of forewords which were inspiring from Jimmy Marshall (written in 2008) and a great summary from Ian Parnell as to why the Ben is among the best mountains for climbing in the world. I could easily sit at home and spend hours and hours poring through this book, so many interesting stories and photos. Even the earlier parts of the history that were covered in Ken’s original edition have been extensively revised and updated and I really felt like I’d read a new chapter on the little talked about but unbelievable Brian Kellett and his enigmatic life and death soloing new routes on the north face. For anyone with any interest in The Ben, either as a general interest in the stories of climbers, or from first hand connection with the mountain, as far as I’m concerned it’s the most essential book to own since extreme rock. It’s also a lovely book as an entity in itself, presented to the highest standard as you might expect from the SMC writing about our most important Scottish mountain. As soon as I could I ordered a load of copies for my own webshop to help distribute this work to a new generation of climbers who I’m certain will be inspired by it. You can get it here. I even decided to make a bit of a promotion with a special priced bundle with my own appreciative work on Ben Nevis; Echo Wall. Was just building the fire this morning and listening to Kelly Holmes (olympic gold winning runner) promoting a new system of encouraging competition through sport among kids at school. Seems quite a polarising issue, some feeling that competition is good for kids confidence and motivation, others feeling it was destructive to these aspects. The defense of the latter view was that competition can be good for kids but it’s very dependent on how it’s presented. I agree with this, and I think they should be making this message the centre of their promotion rather than the simpler message that competition is good per se. When this idea reaches through schools, it’s delivery won’t always be optimal, so the messages that will make it work need to be super clear. And applied badly, I could see it seriously backfiring. The atmosphere of competition at my school, especially in sport, left me demotivated, unhappy and ready to drop out of the system at 16. Discovering climbing transformed this for me over the course of a couple of years - the sport teaching me how to enjoy competition, how to handle failure and learning, and eventually becoming able to apply this in other fields. The key to why climbing succeeded was that the nature of climbing mountains and rocks dictates a focus on personal improvement and effort rather than some public measure. The mountain doesn’t care whether you get to it’s top or not, so failure is not embarrassing and bragging to the mountain is kind of pointless. Also, it’s in the character of the places climbing takes you to (impressive landscapes I mean) to encourage humility even during the fiercest competition and effort. 1. Take kids climbing. It would be a shame to stick to the bona-fide mainstream sports - it’s a fickle business trying to find that spark of a sport you connect with. The wider the net of sports tried, the more kids will find the one for them. Also, the fact that it’s a little outside the mainstream is a great leveller - everyone will be starting from square one. It’s a great motivator to see the kid that was always best at football, fighting and bullying can’t get off the ground on the climb you just flashed. 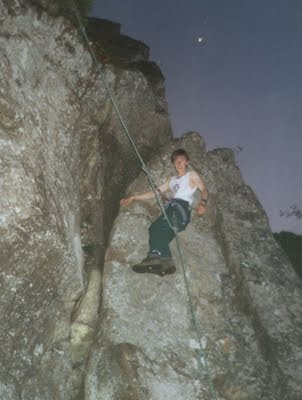 Being light, skinny and thoughtful rather than big, brash and overconfident tends to do well in climbing. 2. Educate parents as much as kids - that making reward and praise linked too closely to public success is dangerous ground. Valuing effort, preparation, patience and critical thinking and leading by example rather than actively pushing will always work far better in the longer term. 3. Train teachers and politicians to better understand and pass on the true value and meaning of competition in sport. In many cases they are too focused on cold hard results, with the important bit - the learning and human performance - relegated to an afterthought. 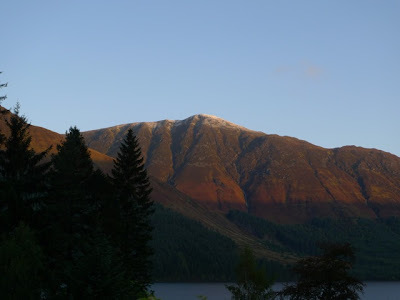 I just woke up and pulled back the curtain to see that yesterdays storms have left the first dusting of snow of the new season on the tops of the hills. 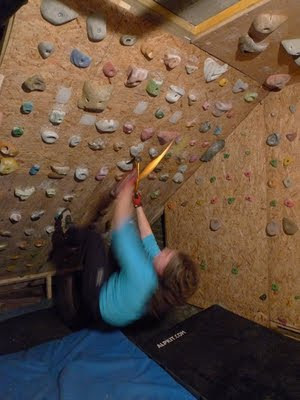 Always exciting moment and a call to get ready for the mixed climbing season. I spent most of last winter worrying myself out of trying the route I really wanted to try and messing about on other things I wasn’t so focused on. 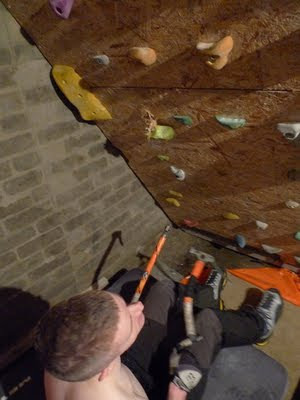 When I finally did try it, I actually did get off the ground and got to the crux. It’s easy to realise in hindsight that life is too short for worrying you’ll get nowhere. So this season I’ll get right on it. I’ll still probably fail, but on this route, if I can fail even a couple of moves higher, that will be awesome. After my last post I decided to finish work early and go out climbing. I put together a wee video below of the afternoon’s activities, working on the project at Sky Pilot and then dry tool training with Kev in preparation for winter. After I got home from all that and stacked wood for a while in the garden I had the foolishness to think I could get away with having a fruit salad for dinner. The delusion didn’t last long. A room with a nice view. 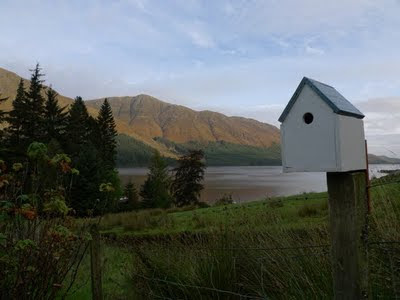 I made a wee bird house recently from ply left over from building my training board and finally found a moment when it’s not been chucking it down to make it available to the local bird population. A much needed break in the west highland rain this morning. The first time in absolutely ages I’ve seen stars in the sky at night. The hills have turned orange, and a nip in the air. A nice lift.